Unfortunately, there’s no perfect answer. Different businesses find different days and times work best for them dependent upon the platform you are using, the content you post, your goals and how your audience interacts with the platform that is being used. There is plenty of data out there on optimal times to post on Facebook, Twitter, LinkedIn, Pinterest, and Instagram. In the infographic below, Hubspot has curated the data and research collected by CoSchedule from a variety of sources including QuickSprout, SurePayroll, The Huffington Post, Buffer, TrackMaven, Fast Company, and KISSmetrics. Think of this infographic as a guideline, not a hard and fast rule. 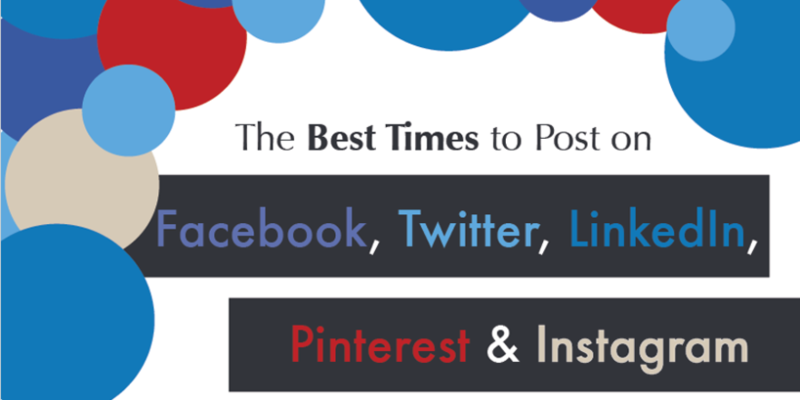 Here’s to helping you find the optimal posting times for your business!